For its fifth anniversary (Canniversary) Sweet Can Productions presents “Yes Sweet Can,” which, when said (or sung) swiftly, is what they do—i.e. “transforming everyday life into circus art.” Joanna Haigood, that multi-talented Zaccho Dance Theater choreographer and director, has organized this talented bunch of merry dancers and tricksters into a lively performing ensemble. What do they do? Sing and dance; transform newspapers into useful props; tap with cans over their heads; walk a tightrope; dance with a broom; swing and twist on a white cloth; twirl countless hula-hoops; and in general remain jolly, pleasing, entertaining and funny. For this viewer, a major plus for this company is their delight in performing. They make contact with their audiences and respond to their own excellent efforts with smiles, winks, and all-round good mugging. We delight in them: they delight in hoots, hollers and applause, which they well deserve. The cast features Beth Clarke as a “sky rope” dancer whose body excels in the acrobatics necessary to keep aloft while turning “round and round” and upside down. How does she keep in such good shape? Clarke is a Pilates teacher. Kerri Kresinski, who teaches acrobatic yoga and dance, prances beautifully with the others, and walks a mean tightrope. She also spins and does the splits on the rope. 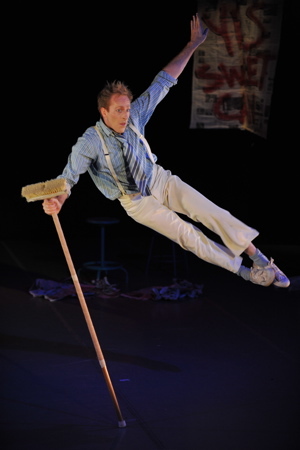 Matt White, who dances and twirls a “flying broom,” has, as the others, worked with The Pickle Family Circus and trained at the SF Circus Center. He supports, amuses and challenges his three fellow performers. During this fall’s Trolley Dances, I met Natasha Kaluza (and her mother) at the SF Public Library when Sweet Can Productions entertained at the Children’s Room. Natasha is tall, funny and the center acrobat for her amazing hula-hoop feat. Her body seems to be able to control dozens of hoops. Hoopla! She is a wonder. Musical director/composer, known as eO, certainly deserves kudos. He leads and follows the clowning with wonderful sound, live and canned and at one point, playing the trumpet, becoming the center stage actor. His timing supports and underlines all action. At Xmas-Holiday time, the choices for entertainment are few and repetitious. If you have “had it” with “The Nutcracker” (“Please Mom! No more ‘Nutcrackers’ and carols sweet and sickening), do go to the Sweet Can production.· They will revive your good feelings about entertainment (all adults are kids), clowning, acrobatics, circus, dance and an hour’s worth of great fun! Technical credits go to: costumes: Callie Floor and Joan Raymond; lighting: Ted Shannon; lighting tech: Harry Rubeck; sound tech: Andy Keefer; props and set: Maya Linke; builder: Kim Schwartz; rigging: Slater Penny; roustabout: Jamie Coventry. Bravi to all!